It’s been an interesting start of the new year for Taya Valkyrie. The Impact Knockouts Division champion emerged from the Homecoming pay-per-view with the title that she’s sought since entering the company in late 2017. Valkyrie also derailed the reign of Tessa Blanchard, who had been the dominant female star for several weeks. With the win, she joined Johnny Impact atop each of their respective divisions, as the first husband-and-wife team to reign as World Champions at the same time, in the same company. Despite the couple being attacked later in the evening by Killer Kross, Valkyrie says that it will always be a special moment for the two of them. “Obviously, John and I have both worked extremely hard – individually, and even before meeting each other – to get to this point,” Valkyrie said an exclusive interview with TheGorillaPosition.com. “So, right now, it’s crazy that the culmination of those years and years of hard work, and the passion we have for each other and pro wrestling… It’s now being exhibited in the fact that we are both holding the titles at the same time. However, her victory in Nashville did not come without controversy, as a rather odd set of circumstances led to the finish of the title match. In the weeks leading up to the showdown, some harsh, verbal jousting began occurring between Blanchard and the match’s special referee, Hall of Famer Gail Kim. The third-generation star seemed to be offended by Kim’s insertion in to ‘her business’, and repeatedly tossed insults at the retired legend. The Undeniable One even went so far as to threaten to “steamroll“ Kim if she got in her way. When that bad blood spilled over in to the title match, Kim got involved physically. From the fallout, Valkyrie emerged with the belt, but there was a bit of backlash from the audience over the funny finish that night. And, Blanchard has been plenty vocal about how she was ‘cheated’ out of the championship. Valkyrie shrugs it off, and says all she is focusing on is going forward with her title reign. Outside of the her dealings in Impact, she is unprecedentedly revered in Mexico, where she’s a two-time Reina de Reinas Champion with AAA. When Impact recently had a set of television tapings in Mexico City, Valkyrie received some of the loudest ovations from the local fans. She cited Konnan and the late Perro Aguayo Jr. among the many Lucha Libre stars who helped her become established South of the Border. She’s also continued to work on entertainment projects with her husband, who has starred in his own film, Boone the Bounty Hunter, and also appeared on this Fall’s season of CBS’ Survivor. Valkyrie and Impact have a movie slated to come out this year entitled, The Iron Sheik Massacre, and Valkyrie says it will debut late this year, during the Halloween season. But, back in the ring, she’s only had one goal in mind, and it was to capture the Knockouts Championship. Now, the lady with the title knows she will have her hands full, as she returns to action tonight on Impact on Pursuit. And in her mind, her journey as the Knockouts Champion is just getting started. “There are a lot of people on our roster that I haven’t had the chance to be in the ring with yet,” she said. “So, I’m definitely looking forward to that, I feel like we have such a strong women’s locker room right now, and everyone is looking for an opportunity. She won the Knockouts Championship and was taken out in the same night. Homecoming must have been a bittersweet pill for Taya Valkyrie to swallow. She captured Knockouts gold by finally defeating Tessa Blanchard. It was the crowning moment of her career and she was most likely looking forward to celebrating with her husband Johnny IMPACT, who also retained the World Title at Homecoming. 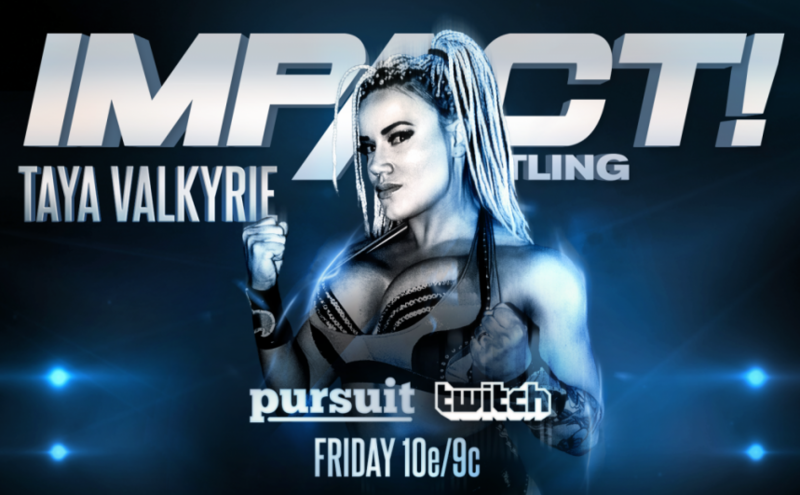 All thanks to one man, those plans drastically changed and Taya Valkyrie spent the night in a Nashville hospital recovering from the attack by Killer Kross.